This Kellogg Pact however was used as the main support for convicting the German political and military leaders of crimes against peace and hanging them. Unfortunately, what the former Lord Chancellor of England stated in his book U.N.O. and War-Crimes was not yet known at that time. Viscount Maugham deals exhaustively with the Kellogg Pact and resolutely rejects the Nuremberg Tribunal's claim that the Pact gives entitlement to impose penalties for violating its terms. The execution or imprisonment of numerous soldiers, naval officers, and statesmen of a signatory state could hardly be useful for this laudable goal. Such steps will very much sooner lead to exacerbated hostility. 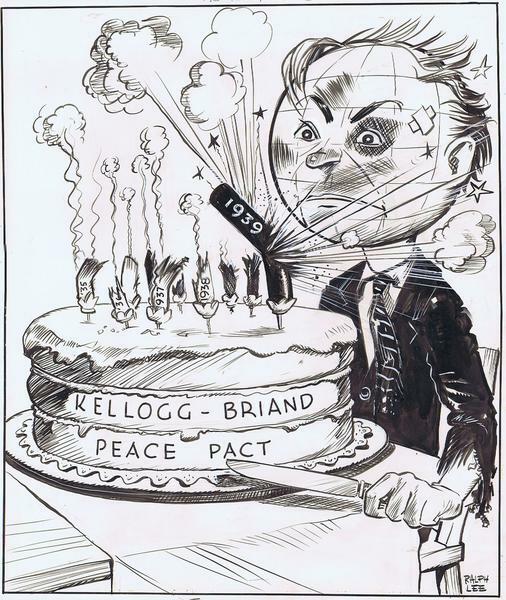 The Kellogg Pact, ever since its signing in August 1928 -- thus long before 1939 -- was in fact never taken as a reason to brand as criminal and to treat as criminal any power subsequently involved in a war. That the Kellogg Pact in 1939 was treated as no longer in existence even by its most important signatory states, is most clearly proven by the fact that even England and France, in their declarations of war against Germany, were not able to invoke the Kellogg Pact but only their disastrous guarantee to Poland. "This guarantee declaration shows once more how much Great Britain drew conclusions, taking a sensible political view, out of the decline of the collective security system, and how small a confidence it had in the practical results of the moral condemnation of war through the Kellogg Pact." The Kellogg Pact, the basis for both the indictment and the convictions for crimes against peace, was not adequate for the task that the Nuremberg Tribunal tried to pretend that it could do. Again and again recourse was made to the self-made charter. Thus even these judges found themselves in effect obeying orders. They had to invoke that charter, which was incompatible with the acknowledged international law of the time. The appeal to superior command or superior directive of a government however was forbidden by precisely this charter. The all-powerful judges thereby found themselves in legal difficulties that they could not overcome through any pettyfogging (Rabulistik) however apodictically presented. How simple, clear, and consistent, by contrast, is the principle of their Soviet Russian colleague Nikitchenko. As early as 20 June 1945 he revealed his universal formula. This Soviet law of brutality has the advantage of doing without Anglo-Saxon hypocrisy.